Sew what's cooking with Joan! 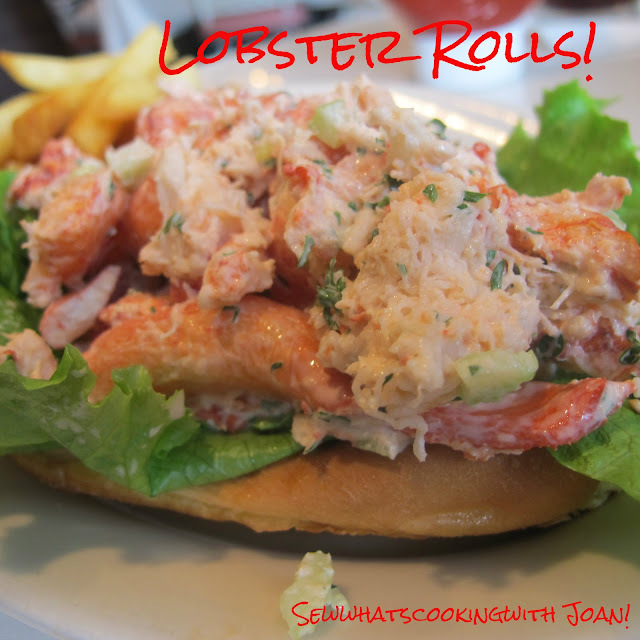 : Lobster Rolls! Lobster rolls are this Fall's slider—the food of the moment, the dish on every trendy menu. And why not? This purely American invention has a contradictory character; it tastes like freedom, like Summer on a plate on a Fall day! And at the same time it is the most luxurious sandwich ever invented. 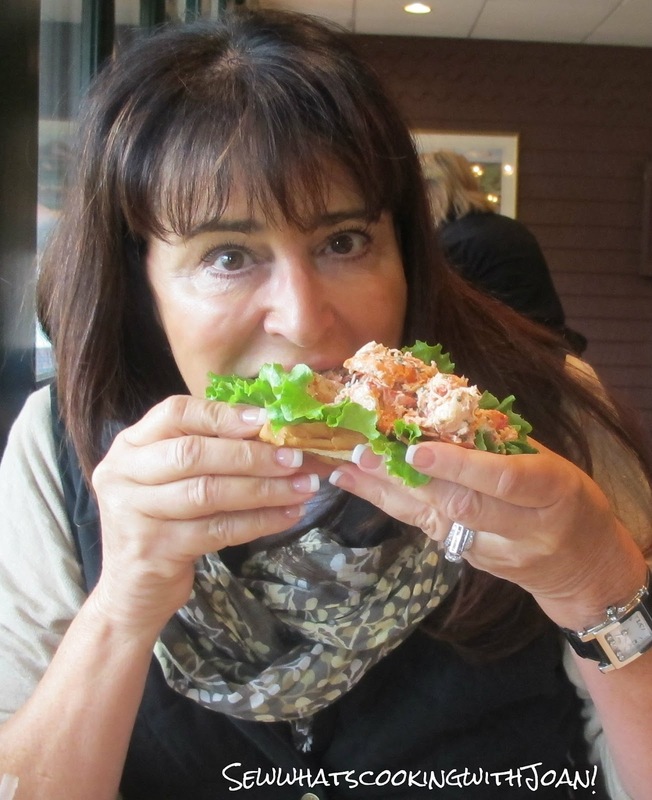 And since I am on the east coast doing a Fall leaves tour, I thought okay lets find the best lobster roll. Lobster rolls are mostly made ahead, they’re perfect party food. If your friends have been eating them out, they’ll be thrilled that the one you serve them can be so much better, if you consider these tips. 1. Begin with live female lobsters. Pre-picked lobster meat is often over-cooked and usually contains too much slippery claw meat and too little of the tastier tail. Why female? Because they’re sweeter, and because you want the roe. How do you tell if a lobster is female? Look at the swimmerets on the bottom of the tail; on a female the first pair of swimmerets (the ones closest to the head), are soft because this is where she carries her eggs. On the male this pair is hard and bony. Humane cooking method below. 2. Make your own mayonnaise, don’t use too much, and stir in all of the roe and the tomalley. This will give you a huge jolt of flavor. 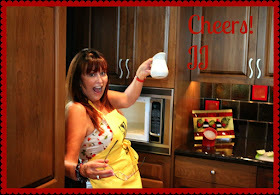 I just love homemade mayonaise and have been making my own for 30 years. It stores in the refrigerator and is easy to make with your food processor. 3. Do not add too many other ingredients; I like a little celery for crunch, a tiny bit of chopped green or red onion, and the zing of lemon juice. But if you want the taste of the lobster to come singing through, you need nothing more. 4. 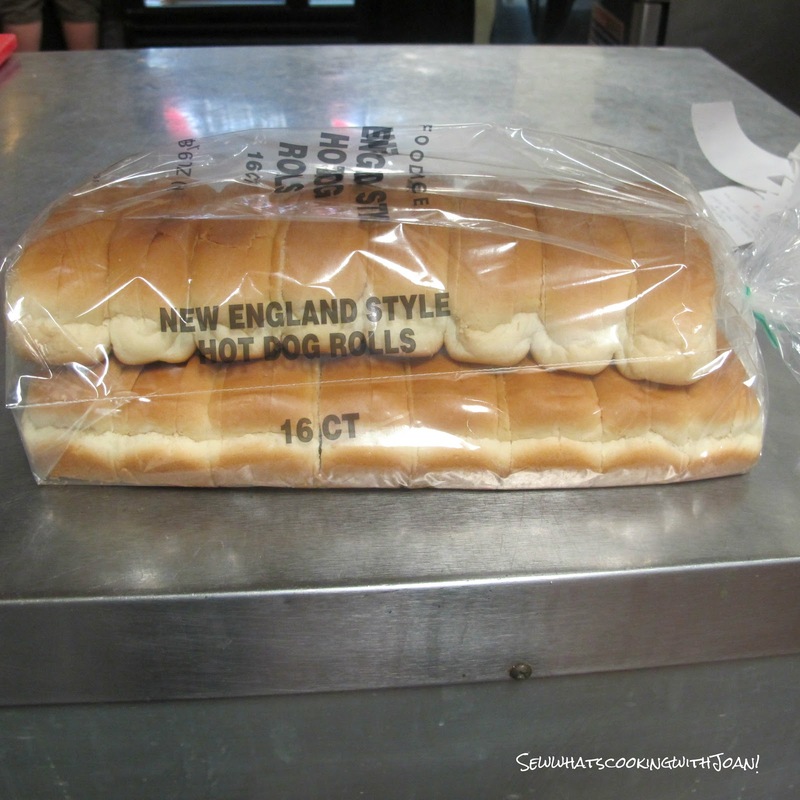 Use New England style hot dog rolls or Pepperidge Farm hot dog rolls, the kind that are split at the top, and toast them in a pan with sweet butter. They crisp up and stay soft, almost chewy inside. 5. Serve your masterpiece while the bun is still crisp, hot and buttery; it’s a wonderful contrast between that and the cool lobster salad. 6. Serve with good potato chips which is traditional or my favorite extra crispy french fries, New England Clam chowder or just a side salad. 2 lobsters, 1¼ pounds each. 2 New England style hot dog buns or Pepperidge Farm top-split hot dog buns or make your own New England style hot dog buns. Note that the buns are connected together. Where they are connected is the area that gets toasted. This is very important to the taste of the bun/lobster roll. The bun has a split on the top, you can barely detect it from the second bun from bottom. 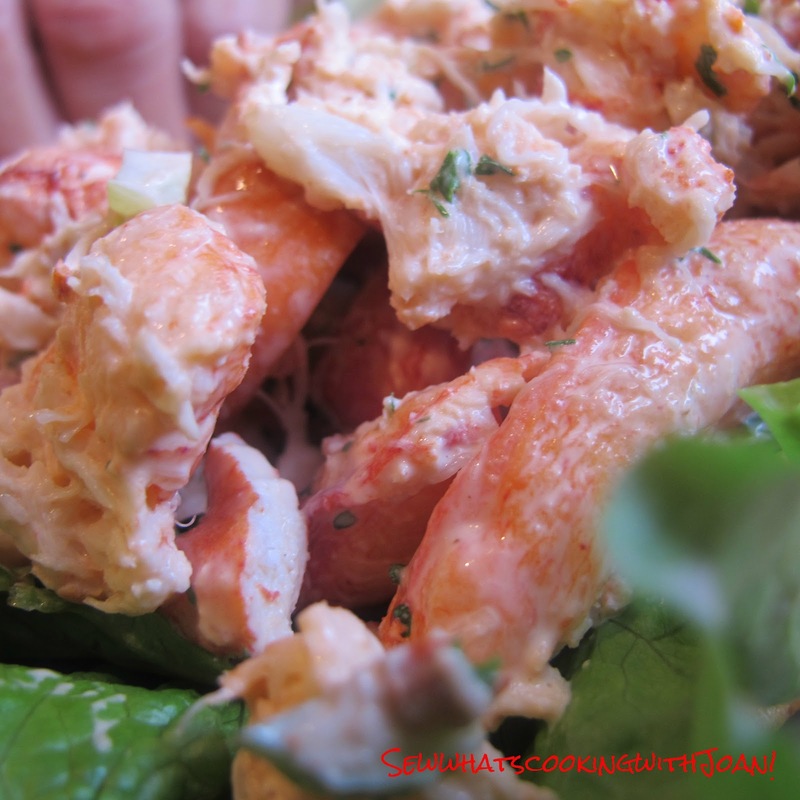 Cook, chill, and shell the lobsters: Cook the lobsters using my guiltless way below. Drain well. Remove all the meat from the lobster and chop into ½-inch pieces, reserving the tomalley and the roe in a small bowl. Dress the lobster: Stir the tomalley and roe into the mayonnaise, and dress the lobster meat with it. Add celery, onion, lemon juice and salt and pepper to taste. Store in the refrigerator (it will last 2 days). 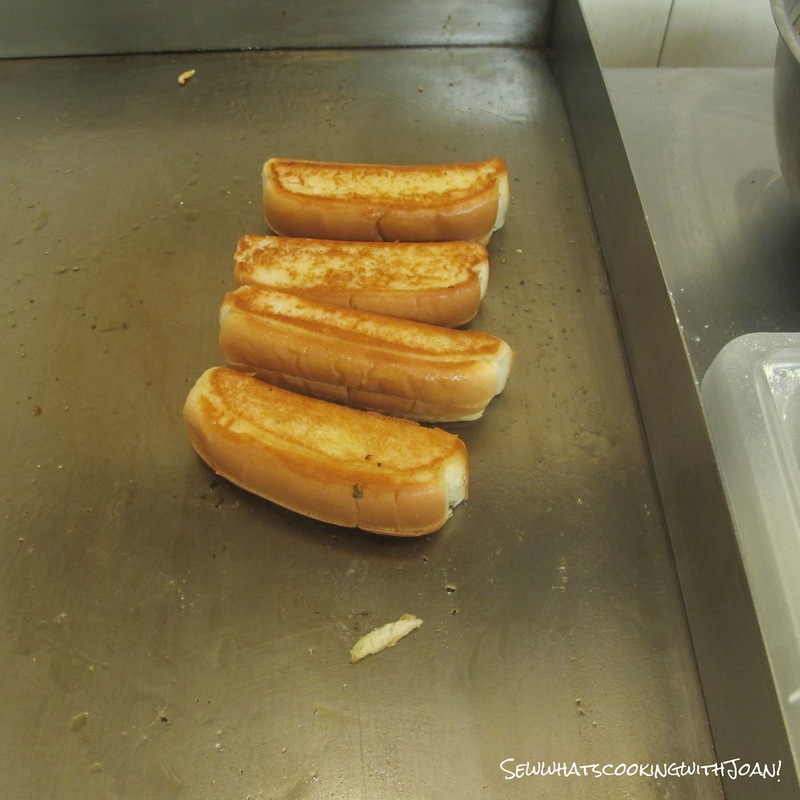 Butter and crisp buns: Just before serving, melt a pat of butter in a small saute pan over medium heat and toast the hot dog buns on one side. When they’re golden, remove them. Add the second pat of butter and toast the buns on the other side. Spoon the lobster salad into the buns and serve immediately. This is more than you need. But it keeps for at least a week, and there’s something wonderful about knowing you have homemade mayonnaise on hand for sandwiches, tartar sauce and dressings. Food processor: Put everything but the oil into a food processor and process until creamy, about 15 seconds. With the machine still running, slowly pour the oil into the machine until your mayonnaise is the consistency that you want. Your food processor has a little hole in the top of the lid, that works perfect for this, just fill the reservoir and let it slowly drain in and fill again until you have used all your oil. Simple is best in my book. 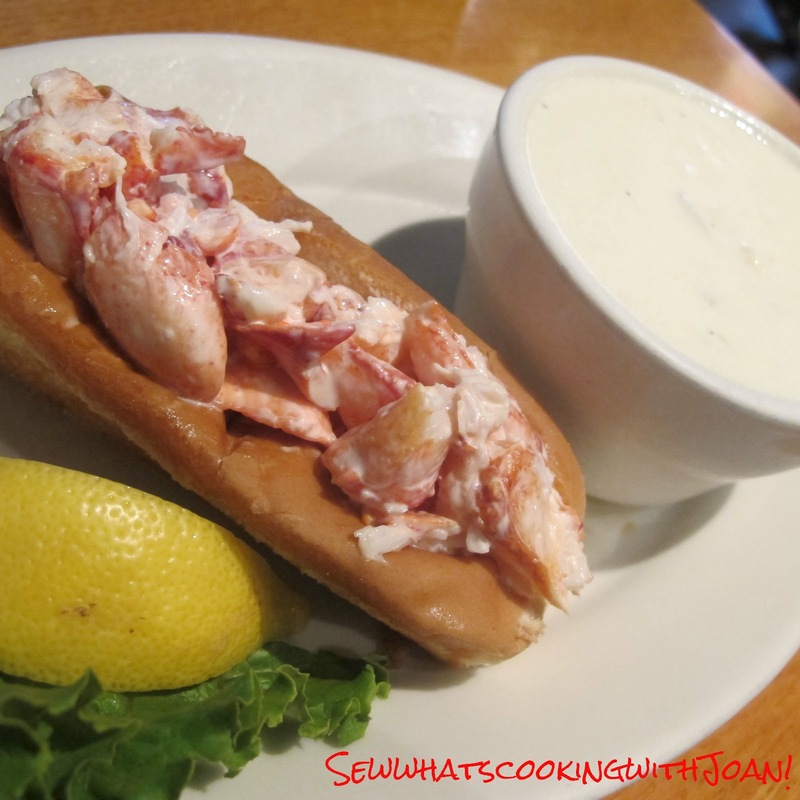 Pair it with a New England Clam Chowder and you have lunch! This method I have used for 30 years and learned from Nancy Lazara during my certificate series. This can be done with the crab as well. I remember being mortified the first time I cooked crabs in a big pot of boiling water, and they started tapping on the lid, asking me to take them out......ugh, it was horrible. The most humane way to kill a lobster/crab is to freeze it first for 15 minutes to numb it, lay it on its back, then plunge the tip of a knife into its soft white belly, and quickly slice from the top of the tail to the head. (Note: this is different from and more efficient than the classic French technique of slicing the lobster's head between the eyes). It will die instantly and painlessly, and then you can steam it in a basket over boiling water for about 15 to 20 minutes (until the shell turns red and the tomalley turns green), or grill or sauté it as you please. The freeze-and-stab method is a little more hands-on and grisly than the drop-in-the-pot-and-run-away method. But worth the effort for guilt-free seafood. Wee Bear and I are on our Fall Leaves cruise. I must say, we haven't found the huge amounts of leaves changing yet, as the leaves are just starting to turn the brilliant hues of autumn. But, we have found some and we have been having a wonderful cruise meeting people from all over the world, and seeing and eating some wonderful food and drink. Since Wednesday we have been to St. John, New Brunswick and yesterday we were in Halifax, Nova Scotia, a beautiful and bustling city. As we make our way into the St. Lawrence Seaway, we are at sea for two days. So, as I write and post this morning we are at sea! I have a movie making class to attend today and three lectures plus I must fit in my workout!! I may be able to post my movie trailer later today on this blog, so check back. I have been busy filming and have put together a trailer, which my instructor assigned to me two days ago. After today's class, maybe it will be ready to post. Sorry, we are at sea and I am working off a satellite, I was unable to download the trailer. I will download and share when I get a faster connection. 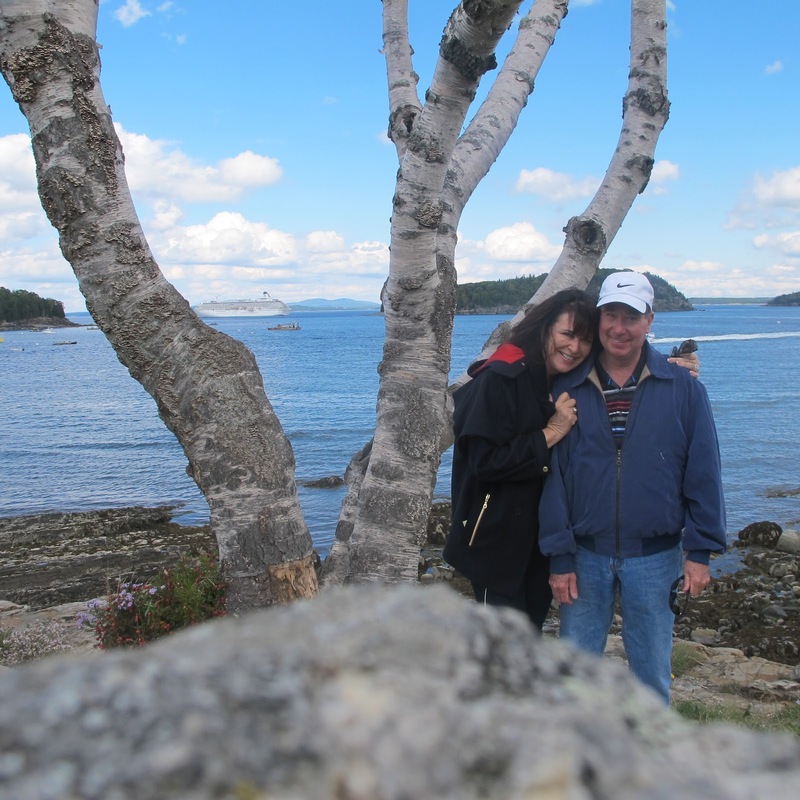 Bar Harbor, Maine Our cruise ship in the back drop! Have a great hump day! Check back to see Sweet One on Friday!